This turned out to be a simple dessert to make, given ready-to-bake puff pastry. Pepperidge Farm pastry works best. Unfortunately, my puff pastry expanded too much in the oven, and ended up making an 'M' shape; I think next time I'll pinch the neck area a little tighter and make the two 'ears' at the end a little smaller and actually curl the ears. *Makes about 32 palmiers from one package of puff pastry. Using a pastry brush, paint the entire pastry sheet with melted butter. Then sprinkle confectioner's sugar to coat. Next, fold the two ends toward each other as shown in the diagram below. 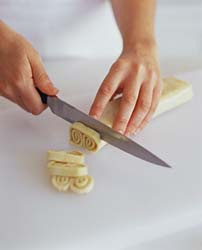 The pastry sheet should look like the diagram shown below, with the two ends meeting in the center black line. Next, fold it one more time back on itself, into a long rectangle, so that the border where the two ends meet (black line), is facing to the back. Lastly, cut the rectangle into ~16 smaller portions, with horizontal cuts. Pinch the neck together, flare out the tips into 'ears'. Bake at 425 degrees F for 10-15 minutes. Midway through, make a solution of heavily concentrated sugar in water or egg wash, brush on pastry. Here are the palmiers before baking, with their 'ears'. After baking, the syrup glaze browned it nicely. Of course, another probably simpler way to avoid all the folding is to first brush and coat with sugar as one would normally do, then roll both ends towards each other until they meet in the middle. Then cut into pieces.